Campbelltown Harlequins rugby union club first grade player Mitch Gordon says the team is determined to help local MP Greg Warren win a bet with a fellow Labor politician. 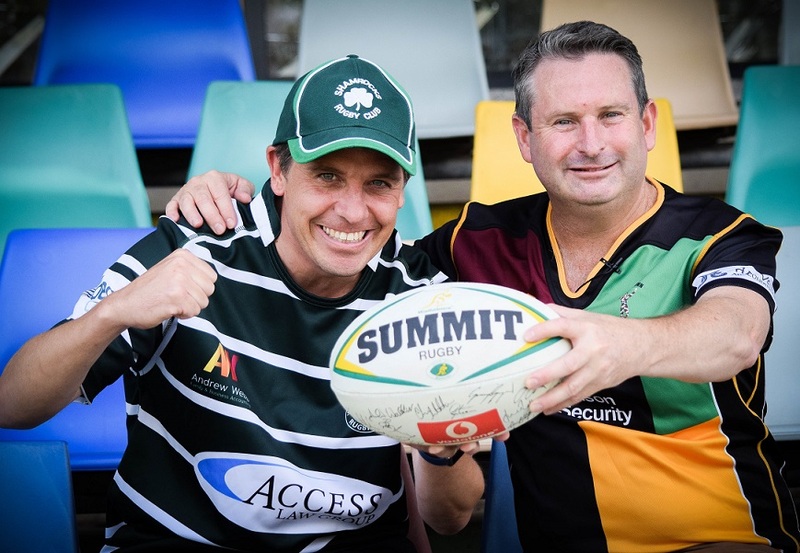 Keira MP Ryan Park and Mr Warren have backed their own local rugby teams to beat the other in two clashes as part of the Illawarra rugby premiership competition. The loser has to feature their opponents’ jumper on a wall in their electorate office for a week – as well as getting up in parliament to admit defeat. Woonona Shamrocks and the Harlequins will clash on May 18 and July 27 and Mitch Gordon has declared the Campbelltown side will do all in their power to protect Mr Warren from the ignominy of showcasing the enemy’s jumper on his office wall. Bet: Ryan Park, left, with Greg warren. “Greg is regularly spotted on the sidelines cheering the boys on and it doesn’t go unnoticed,’’ he says. “It would be a crying shame if he had to hang a Shamrocks jersey on his office wall for a week – it would actually be an insult to the entire community of Campbelltown. The first of the two fixtures will be held at Campbelltown Showground on May 18 with the second leg to be played at Ocean Park in Woonona on July 27. Naturally, both MPs are confident of a favourable outcome. “It’s shaping up to be a great season and I’m confident we will see the mighty Shamrocks jersey displayed prominently on Greg’s office wall after July 27,” says Ryan Park. Unsurprisingly, the Campbelltown MP begs to differ on what the outcome will be. “Ryan and I have enjoyed a long friendship built on common interests, beliefs and ideals. “But when it comes to who we cheer for in the Illawarra rugby union comp, there is no common ground. “I’m a passionate Quinnies supporter and he is an unwavering Shamrocks fan.